So many things have been said about Chanel Dragon Le Vernis that I don't think it's possible for me to add anything new to the dialogue. 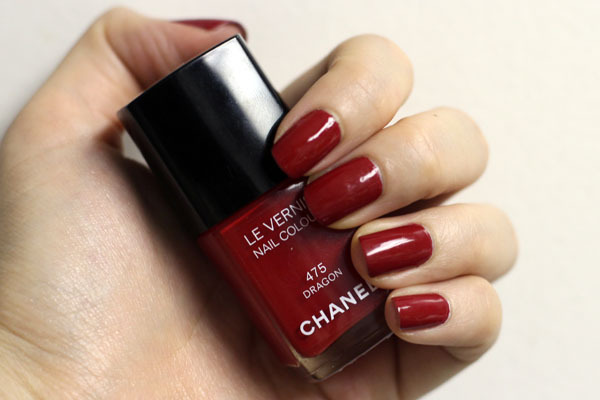 It's one of Chanel's most iconic nail lacquers (can you imagine the day they discontinue this?) and a must-have for anyone who considers themselves a nail polish collector. With so many disappointing recent collections, I only wish Chanel holds to the high standards that come with a bottle of Dragon to each of its nail polish releases. Chanel Dragon Le Vernis currently retails for $26. Chanel nail polish prices rise like Chanel bags (I think it was $22 just a year ago? ), so if you have this on your wish list consider getting it sooner rather than later! LOVE Dragon. One of my favorites. Off topic but would love to hear what you think of your Estee Lauder shimmering sands. Just bought it last week, not quite sure what to do with it!! GORGEOUS! Such a classic look! Glad you're back safe and sound! Do you miss London as much as I still do? Good GOD that is gorgeous! You wear it so well with your skintone! I have a few Chanel reds but not Dragon. DO I REALLY HAVE TO, XIAO? You look stunning and amazing in red! Liz- YOU TELL ME, LIZ. dani- this was totally my Irene Adler look. Sunny- they're definitely inconsistent, which makes me kind of pissed. When they're good they are VERY good (like Graphite, Dragon, Particuliere, etc.) but when they're bad they're horrible (like Black Pearl, Mimosa, Riva...) It's irritating when you don't know when you're getting the $26 worth (arguably... no polish is worth $26 but I guess I'll never stop). It's gorgeous. Wow. Generally, I prefer my red polishes much brighter, but this is all kinds of perfect. P.S. Love how you posed with your fingers in that second shot. Instant nail ad! I have to say, this red lipsttick looks great on you! That is indeed a stunning red...I love how dark it is. I haven't worn red polish in YEARS, but this is calling my name. How does the Chanel Laque lip color in Dragon compare to the D & G Iconic lipstick? I'm in a never-ending quest for a deep red lipstick, darker than the Chanel La Fascinante that I already do own. I fell in love with the Dragon color, only to find out its nowhere to be found anymore. Many thanks.